It’s the last couple of days before we’re off for a week. Off to a bustling city full of heady spice, labyrinthine alleyways and turbaned potion sellers. I’ll tell all on my return – but safe to say I’m expecting some excellent material to write about when I do. 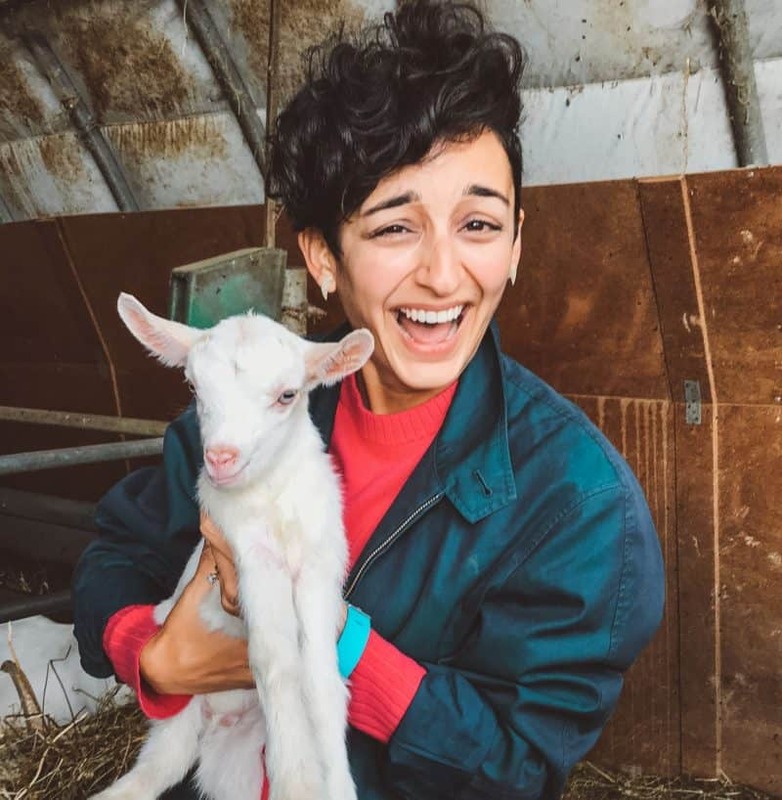 The process of getting to the destination you seek out when it comes to travelling is more often than not plagued with mediocre meals and insipid flavours. The majority of us (who can’t justify flying anything superior to economy) are either faced with a Boots meal deal to take on the plane (is there anyone who doesn’t choose Innocent for the drink?) or worse, decide to risk the in-flight meal – a brick of a chicken breast which when hacked into is as hot as the sun, alongside an array of sorry excuses for vegetables that have been microwaved into another dimension. Top that with a dessert so sweet you won’t get a wink of sleep and a stodgy side roll. Delicious. So I’ve decided to take matters into my own hands by taking a picnic, of sorts. I’m after something that we can have to eat the night before we leave, can sustain us en route to the airport and on the flight, is easily transportable, is in separate portions, and can be eaten cold. And if possible, something that demonstrates a bit of skill. The word ‘tart’ comes to mind. 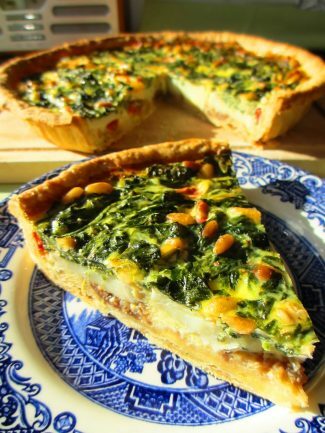 A bit like a quiche but with a healthier yoghurt and egg filling rather than cream and egg – great hot or cold. Makes enough to line a 23cm/24cm (9”) tart tin. Make sure your tin is loose bottomed. You could buy a ready made pastry case for this and just work from the filling onwards. But why do that, when you can make it yourself. It’s one of the easiest pastries there is, and it’s much more fun. All you’ll need is a rolling pin. 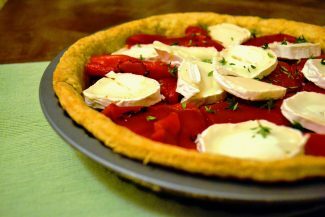 This recipe for shortcrust is from Paul Hollywood’s How to Bake. The golden rule when making this pastry is not to overwork it. The less handling time it gets, the more crumbly and melt-in-the-mouth it will be when cooked. So once it’s brought together, avoid any further handling. Put the flour and salt into a bowl and mix together. Add the butter cubes. Rub the ingredients together lightly with your fingertips until all the cubes are incorporated into the flour and you’re left with a breadcrumb consistency. Add the egg yolks and being to mix with your hands, then slowly add the water and mix until a paste is formed that leaves the sides of the bowl clean. Tip the pastry onto a lightly floured surface and shape into a ball – remember not to overwork or handle it too much. Flatten the pastry into a rough disk with your fingertips (this will help with rolling out later), wrap in cling film and keep in the fridge for as long as you can – minimum half an hour, over night is really best. 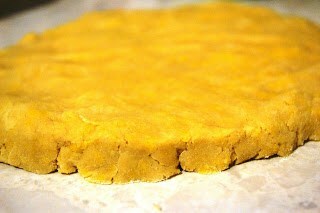 Once chilled, take it out and place on a lightly floured surface. 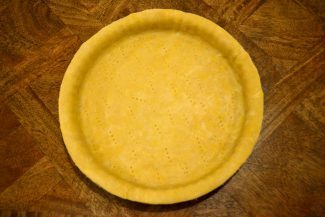 Roll it out so it’s larger than your tart tin – you want it to line the base, sides and have extra hanging over the sides that you can cut off. The thickness of the pastry should be just short of the width of a pound coin. Carefully roll the pastry onto your rolling pin to help you lift it and lay it over your tin. Using your knuckle, push the pastry right into the corners and the sides. Slice off any excess with a sharp knife while rotating the tin. Now you need to blind bake the pastry case. This process partially cooks the pastry before any filling is put into it. This is needed if the filling would take less time to cook than the pastry, which is the case in this recipe. Preheat the oven to 180C / fan 160C / gas 4. Prick the pastry all over with a fork to prevent the pastry bubbling and going out of shape – do lots of holes and right to the edges. You want them as deep as you can without breaking through the base. Chill the pastry for at least 15 minutes – the colder it is at this stage, the less it will shrink from the sides during baking. Get a large piece of baking paper much bigger than your tin, and grease one side with butter. Place the sheet over the tin butter side down, and push right into the sides. Now fill this paper with baking beads (available in cookware shops and good department stores) or uncooked rice. This weight will prevent the pastry bubbling and ensure an even cook. Ensure the paper is touching the pastry all over, right up to the edges. Bake for 10-15 minutes until the pastry is cooked and opaque. Carefully remove the paper and beans / rice (if any bits are bubbling up at this point, prick again with a fork) and return the empty tart case to the oven for 10 minutes or so, or until the base is dry and crisp and the top edges just start to turn golden. Leave in the tin and continue with the recipe. Gently fry the onions in some oil on a very low heat for as long as you can give it – you can do this while you’re blind baking your pastry. The longer and slower they cook, the stickier and sweeter they will be. 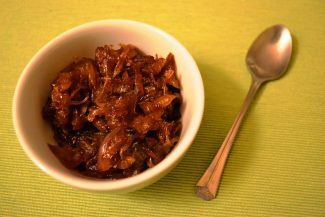 For the last few minutes, add the balsamic vinegar and cook until it’s reduced and you’re left with caramelised onion marmalade. 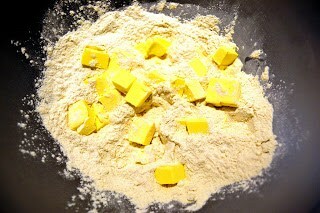 Spread this over the base of your pastry. Arrange the red peppers and slices of goats cheese, and sprinkle with the thyme leaves. In the meantime, wilt ¾ of the small bag of spinach in a pan – put 2cm cold water in the pan, add all the spinach, put the heat on medium and keep the lid on. They’ll wilt in no time. Drain the spinach and using kitchen towel to soak up as much of the water as possible. Then chop the spinach up a bit. Mix the eggs with the yoghurt, add the cool cooked spinach and the toasted pine nuts. Season well with salt and a good amount of black pepper. Pour this mixture over the tart filling. Bake in the oven until the filling has set and the pastry edges are golden brown. Serve hot with a side salad of rocket or spinach, or enjoy cold and on the move. The goats cheese cuts through the sweetness of the onions and peppers, and the pine nuts provide welcome texture. 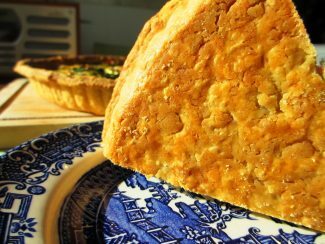 The pastry is just wonderful – thin, buttery, crumbly and completely dry. No soggy bottom – Mary Berry would be proud. This tart is quite versatile in the sense that you could fill it with anything that doesn’t have a high water content, and then pour the egg and yoghurt mixture over it. For example roasted artichokes, sun dried tomatoes, charred asparagus spears to name just a few. Once you have the pastry nailed, you can experiment with any number of fillings. 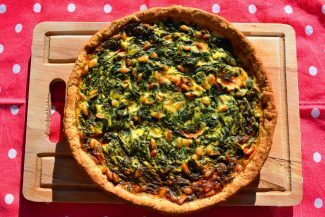 The yoghurt and egg mixture on top is a great replacement for the high fat cream and egg mixture of a standard quiche, especially if you use a low fat variety of yoghurt. I don’t believe there’s any detriment in using the 0% fat Total yoghurt over the full fat – this is a good (but rare) example of there being little difference between the two. My preference of unsalted butter whenever I make pastry is the President butter from France. It’s so beautifully pale that when I’ve chopped it into cubes, I must consciously remind myself not to mistakenly think it’s cheese and scoff a piece. The aroma it gives off not only when being baked, but even at the very first stage of rubbing the butter into the flour with your fingertips, is completely delicious. You’ll easily find it in any supermarket. Sliced and protected with some foil, this tart would do well on its short voyage to the airport. How much of it realistically makes it out the door in the first place though, is a different matter. Two pieces seem to have already disappeared whilst writing this entry. Dammit. Wonderful to hear, let me know how it goes Simon!